Over a dozen hours into The Sims 4, I'm only now starting to delve into a core part of the experience: killing your sims. At least, I assume that killing sims is an important part of the experience, given all the backlash surrounding the lack of pools in The Sims 4. When I initially read about the pool thing, the entire fiasco struck me as odd. People seemed to really care about drowning sims, and they seemed really upset that they couldn't do that anymore in The Sims 4. I didn't get it: why would one want to kill their characters? Isn't that sort of, I don't know, awful? Instead of having the normal thing happen—someone croaks, Grim comes around and reaps shortly after appearing—the sim just...refused to die. The game would acknowledge that the character was dying—I mean, the Grim Reaper was hanging around, for cryin' out loud. But the game just couldn't kill the character, for whatever reason. So hilariously, MrAkamoll tried to do everything in his power to change that. He sped the game up. He talked to the reaper. He engaged in conversation with people who stop and watch the dying sim. Romances and friendships bloomed right next to the dying sim! He even tried leaving the map, but the game wouldn't let him—you can't travel while a sim is dying. So he did the only thing he can do: he started befriending the Grim Reaper. Eventually, the game just crashed. The video fascinated me, but I also wasn't sure if it was actually a glitch. So I set off to try to kill a sim myself, the hope being that I could test out if the guy in the YouTube video simply did something wrong, and that's why they couldn't kill the sim. What I'm saying is, I took up murder in The Sims 4 because of science. First, I picked my target. I figured it had to be someone I wouldn't miss. For me, that was my son, Princeton Goth—who had grown up to look like a bit of a douchebag. What you have to appreciate, is that up until that point, I'd played The Sims by trying to avoid death as much as possible. Whenever a sim in my family grew old, I would cheat and reset the sim back into young adulthood. As a result, the entirety of The Sims 4 slowly aged without me. My family, meanwhile, must've looked like the Cullens or something. The situation was weird, and it could only go on for so long. I took up murder in The Sims 4 because of science. I'm sorry, Princeton. It was the fedora. You shouldn't have worn that. Our family is more stylish than that. ...oh god, there's no way to talk about any of this without sounding deranged, is there? In any case...being new to The Sims, I wasn't all up on the most efficient ways to kill sims. The only method I had heard about involved putting a sim in a room and then taking out the doors. Honestly, trying to devise something more complicated than that unsettled me. I tried something even more basic than that to start off with. First, I tried to simply deprive Princeton of food—I'd order him to do the same thing over and over again at the park for days. Despite getting many of his 'needs' meters becoming orange, Princeton did not die. Fair enough. That's probably realistic. Next, I instructed Princeton to go take out the garbage. Then, while he was doing that, I constructed a fence to trap him in the garbage area of my house. Having nothing to do, Princeton would simply sit on a bench next to the trashcan for hours. Sometimes, he would pull out his phone and play a game or something. But mostly, he would sit there and plead for food, human interaction...anything. I watched all of his needs go into the red. I'm not gonna lie, it was kind of disturbing—especially since, devoid of a bathroom, Princeton—my son!—simply peed himself over and over again. A week went by, and Princeton continued to live next a trashcan sans food. Nobody noticed he was gone. And then, for whatever reason, Princeton's sister, Anne, decided to stand next to the fenced area—and naturally, Princeton rushed over and started talking to her. Despite seeing her brother at his lowest ever, Anne happily spoke to Princeton about sports. That's just the sort of sim that she is: cheerful. Then Princeton's brother came along, and also started chatting Princeton up. Then his aunt came over. Horrified, I instructed the family to leave immediately—couldn't they see I had marked this sim for death? But, in a way, it didn't matter. It didn't seem like I could fully deprive Princeton of social activity. Princeton, after all, had a phone at his disposal. Every so often he would call someone up. I couldn't help but wonder what in the world they talked about. Did he cry out for help? Did he tell people he was trapped somewhere without food, next to a trashcan? Did he explain why he was mysteriously incapable of hopping over a very small fence? Did he try to order some food, perhaps? I don't know. What I do know is that, despite speeding time up, and despite Princeton not eating for weeks, he was still alive. What gives? Was killing a sim supposed to be this difficult? I asked Twitter for some input—perhaps some veteran simmers could direct me to some more efficient methods of murder. A few people suggested something involving fire. I recalled that at one point, one of my Sims bizarrely caught fire through my fireplace. Maybe I could do that again? Hopeful, I installed a special fireplace for Princeton. Then, I instructed him to light a fire over and over again, praying that he would make a mistake and expedite this grueling process. He didn't. Princeton would regularly soil himself, he would regularly fall over in a total lack of energy, but boy, was he an ace at tending to a fire. I sped the game up. I played other sims, completely ignoring Princeton for a while. Nothing. I almost resigned myself to the idea that Princeton was never going to die, that maybe Maxis had changed the game so that sim murder wasn't a key part of the experience anymore. Or maybe it was more sinister than that. Maybe the goth family were actually vampires all along? Naw, though. Eventually, and somewhat randomly, Princeton did die. It took weeks, and it did not involve fire, but Princeton Goth died of hunger. Truth be told, it was kind of anticlimatic. Is that weird to say? That, following the death of Princeton, I couldn't help but wonder how much more bombastic I could have been about killing my sim? Because that's how I felt. The journey to kill a sim has irrevocably changed me as a human being. 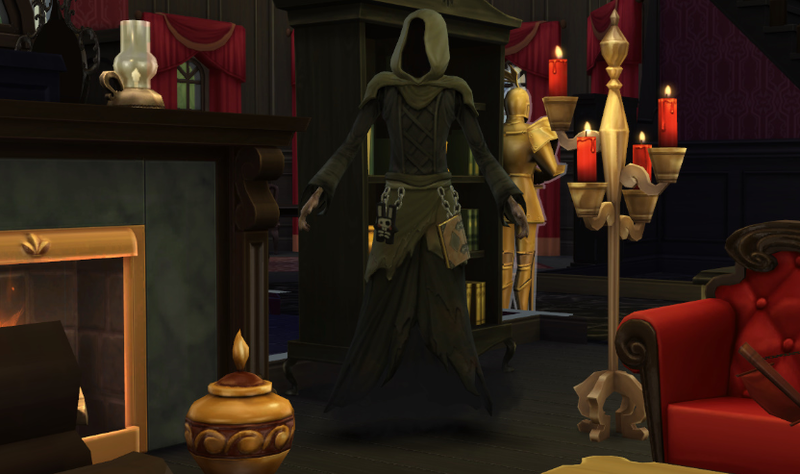 I'm happy to report that the video at the start of this article is indeed a glitch, and that under normal circumstances, the reaper will promptly reap a dying sim. Princeton's dying body was only on the screen for about 15 seconds, before being disposed of. Still, I'm taken aback by how resilient sims are—and how, in a perverse way, I sort of enjoyed trying to kill a sim. I've never experienced something like that before. I'm curious: how are you guys going about killing your sims? Is killing/torturing sims a core part of your experience, even? Is it more difficult to kill sims in this game than in previous games? Might you have some pointers for me, for the next time I decide to murder someone? Let me know in the comments.